When I turn on the news or read about what is going on in the world, I can see the truth of this song. There is so much hate in our world, in our country, communities. People need to see love, experience love, the world needs to learn what love is all about. Jesus’ answer: “What is written in the law, how do you read it? A man fell in hands of robbers who beat him, stripped him off his possessions and left him half dead. – A priest was going down that road, saw the injured man, but went the other way. – A Levite came to the place where the man was, he saw him and passed by on the other side. The priest and Levite represented God’s servants those who were appointed to help people to connect with God. They should be the ones helping this poor injured man, but they did nothing. This Samaritan was moved by compassion and stopped to help the man (v34) Bandaged his wounds pouring on oil and wine. Put the man on his donkey and took him to an inn and left some money so that he would be cared for. You go and do likewise. You go and act like the Samaritan. The Bible tells us that we show love for God by loving others. God loved us and had compassion on us. You showed love when you are moved to act for those in need. -Anyone in need of compassion, any one in need of God’s love; anyone who may be feeling helpless, abandoned. The neighbor can be anyone who opposes your political views; someone who from a different race, economic status. Someone struggling with sexual identity; The neighbors are all around you, even where you work, where you go to school, on the bus or train. They all need to experience God’s love, God’s compassion, his grace. God will use you and I to be a Samaritan to them. Go and do likewise. 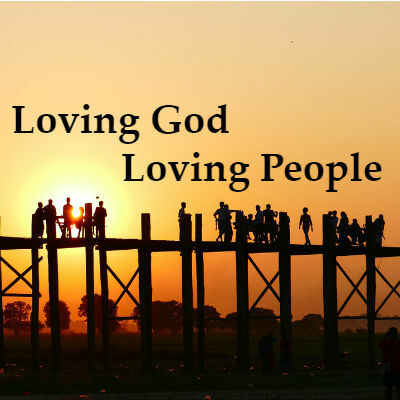 We may learn a lot about God’s love and our love for others. But loving God and loving others will mean nothing if we don’t put it into practice. People don’t care how much you know until they know truly how much you care for them. God’s love and our love for others is to be lived out. Go and do likewise.